Insomniac says it doesn't have enough resources to run three platforms at once. It's been about a year and a half since Ratchet & Clank devs Insomniac decided to jump into the social space with its Pokemon-esque game Outernauts. The idea was to create a title that traditional gamers would actually want to play on a social platform. Now, it's shutting down the Facebook and Kongregate versions on January 31st to better focus on the upcoming iOS version. "While we'd love to be able to keep running Outernauts on Facebook, Kongregate AND iOS, we simply don't have the resources to do so at our high standards," Insomniac posted on its website. " What does that mean? Honestly, it means we wouldn't be able to create new content for all three platforms and more importantly, properly address player inquiries. We have to pick where we focus, and we're going to focus on iOS (and eventually Android)." Apparently, the iOS version won't be just a port, but an entire overhaul. Insomniac will be streamlining the game to focus on the breeding and battling elements, as well as adding new content. 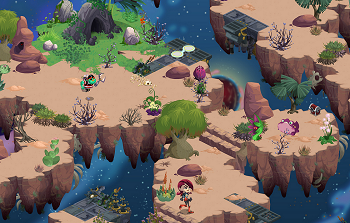 "In other words," says Insomniac, "we've evolved Outernauts specifically for iOS". There will be a rewards system in place for existing players, which will be fully detailed before the dreaded shutdown. Sudden closer notice is never a fun thing, so Insomniac is opening up its arms to feedback. You can reach it via forums, twitter, and email. Being Insomniac's first flash-based game, Outernauts has certain had a lot of growing pains, and it looks like it's only just getting started. As I lie here unable to sleep, reading random internet stuff on my phone, I have to wonder if the Escapist posted an article about Insomniac just to mess with people in this situation. To be honest I'd be royally POed by this in all likelihood if I was playing it, as I'd imagine neither of the other versions were entirely free, an were selling content to the players, all of which will be lost if the game decides to shut down. "Sorry chums, you've given us money, but we think there are more suckers on another platform to do it, and so we're going to abandon you, thanks for the money!" I kind of hope there is something of an outcry and it gets government attention because I've been increasingly concerned about this for years, especially when I consider what it's going to mean if some of the bigger cash grabbing FTP MMOs ever decide to shut down their servers and take all the digital content people paid for with the. It might actually lead to some people challenging EULAs the right way for a change. That said, as I've argued before, I think ultimately the government should mandate that any business selling digital items or services or whatever should be required to have a trust fund established, with the express purpose of maintaining game servers, accounts, and digital property (and employing necessary caretakers) perpetually. The basic idea of a trust is a huge pile of money that generates interest, and only a portion of that interest can be withdrawn without touching the principle sum. With the amounts of money being spent on MMOs and such already it's not particularly unreasonable, as maintaining a couple of servers and minimum wage workers doesn't even go as far as some of the trusts rich people set up to ensure their kids are taken care of and the like. This would of course keep smaller companies out of the game, but when it comes to people losing things they paid for (digital or otherwise) I'm cool with that as I think the protection of property should come first.... that's just my opinion though. I doubt anything radical will come of this, but if this turns out like seems likely, I am hoping it gets attention that starts steering things in that direction.